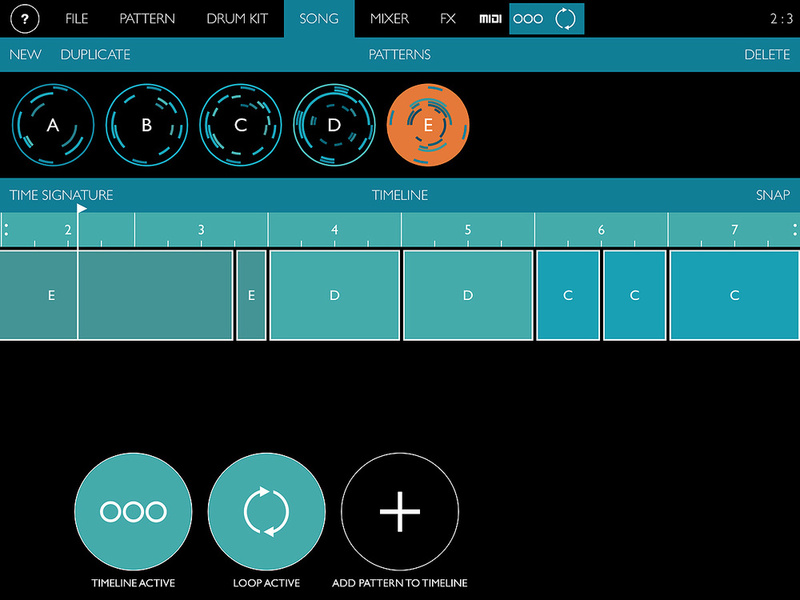 Patterning: a new direction for drum machine programming. With an abundance of iPad drum machines already in circulation, a fresh approach is always welcome. In ‘Patterning’, Olympia Noise Co have opted for circular programming, which has been a cool alternative to linear since Raymond Scott’s Circle Machine of the 1950s. Wherever the inspiration came from, you can abandon the left-to-right preconceptions of TR-style methods and try something new. Patterning’s circular icons bring a visual bonus too, displaying pattern density at a glance. There are five operational windows, accessed by tabs. 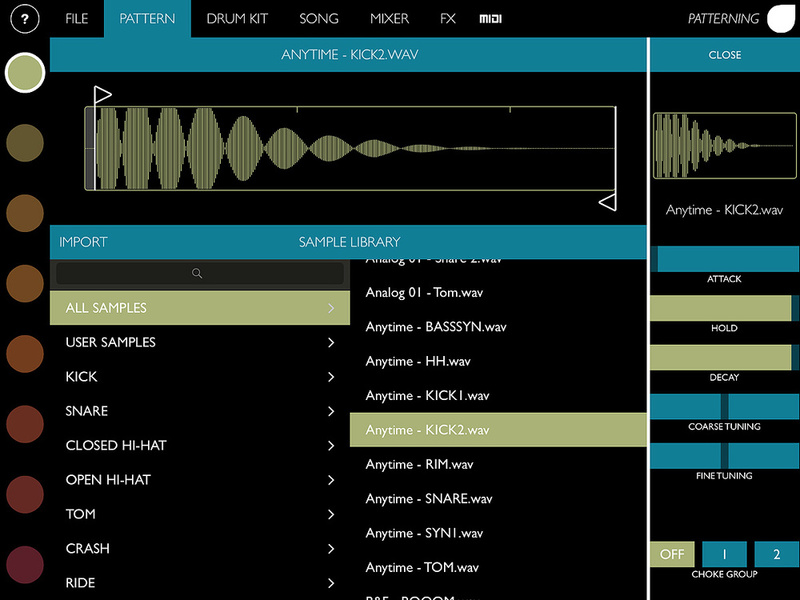 In these you create patterns, select and edit drum kits, adjust the mix and effects, then arrange your work into songs. You’ll typically start with the pattern window, building grooves from up to eight loops arranged in orbits. By default, the kick occupies the outer ring, but you can arrange the samples in any order that appeals. Notes are entered by filling in slices, with the highest velocities set furthest from the centre — like a percussive version of Trivial Pursuit. 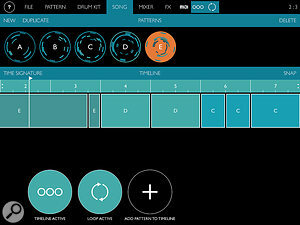 Interestingly, each orbit offers unique length, step duration, direction, swing and ‘auto-rotate’ settings, putting clear distance between Patterning and any traditional drum machine. An orbit can be divided into up to 64 steps and can play in Standard or Euclidean modes. The latter treats orbits, regardless of length, as a 4/4 measure, dividing the steps into equal durations. You don’t ordinarily associate drum machines with the polyrhythmic subtleties of African drumming or gamelan music, but when you hear several odd-length loops running in Euclidean mode, you soon realise Patterning is no ordinary drum machine. With rare flexibility, you can set out your kicks in quarter-note slices, hi-hats in triplets, then overlay some frantic demi-semiquaver percussion. Activate auto-rotate and you’ve got a magical real-time variation generator in which the voice’s active steps rotate by increments of between 1 and 64 steps after each completed orbit. When you indulge in those unique orbit lengths set to playback directions such as pendulum or random, deeply complex and hypnotic patterns can be created. If you relish grooves that take many measures before repeating, Patterning is a delight. Once created, a pattern can be easily duplicated in order to construct variations. Samples can be swapped without interrupting playback.If all that weren’t impressive enough, you can inject more interest using automation. Switching from the conventional velocity display, your pie slices can be used to manipulate the tuning, pan, envelope, filter, effects and even the probability of the step playing — a powerful collection. In use, it’s as easy as drawing velocities, but if you prefer you can hold down ‘Auto Rec’ and record parameter tweaks that way instead. The ‘pen echo’ function enables you to paint in multiple events spaced at intervals: yet another means of generating complexity. Patterning is stocked with drum kits of all flavours; at the last count there were 68 of them, with more appearing for download even as I checked. These encompass a selection of analogue beatboxes, modular-derived pops and bleeps, plus FM kits, techno kits and a fair supply of deranged noises tough to categorise. Naturally you can import your own samples too (via Dropbox, Audioshare, iTunes and the like) and you’re free to select replacements for any voice as you play, or load entirely new kits. Indeed, all actions can be performed without stopping the music — even song construction, which features intuitive finger motions for shortening or extending patterns, selecting exotic time signatures and so on. Effects consist of a versatile delay and an effective reverb, plus EQ and distortion. While they aren’t as extensive as those of, say, Fingerlab’s DM1, the effects are more than sufficient, especially given there’s a per-voice filter. A simple mixer does what you’d expect, with the level, pan and effects sends all candidates for automation. Patterning’s song mode is a delight.Finally, I’m always delighted (and a bit relieved) when MIDI is done well on iOS. Patterning synchronises sweetly to MIDI clock and is unusually flexible in its MIDI transmission capabilities: you can, for instance, specify the note, channel and output port for all eight drums that comprise a kit. As a test, I connected it to the Micro USB port of a Korg Electribe 2. I was able to trigger eight different voices, then subject the Electribe’s drums to the wonders of complex polyrhythms, probability, alternate playback directions and so on, before giving it the benefit of Patterning’s song mode. Released in 1988, Korg’s M1 was arguably the most popular workstation keyboard of the late ’80s and early ’90s. Such was its ubiquity that, if you’ve listened to music produced since the M1’s release, you’ve almost certainly heard sounds from this instrument. That piano sound (Piano 16’, along with one of the organs (Organ 2), would be audible on every house track for well over a decade after the M1 was launched. And Mike Oldfield’s Tubular Bells 2, released in 1992, is almost a love letter to the M1, memorably using programs like Angels and combis like Pankala. Korg iM1’s main page certainly gives you a lot more information than the original’s interface.If you’re unfamiliar with the M1’s architecture, the first concept to understand is the multi-sound, which is an original waveform such as piano, choir, strings or bell. A program is able to play back either one or two multi-sounds at the same time (or a single drum kit), and in program mode, you can play back and work with one program at a time. In combination (combi) mode, you can assign a program to each of the eight available parts on the instrument and play them simultaneously, specifying key zone and velocity ranges, transposition settings and so on for each of the parts. Combi mode made it possible to create some pretty impressive performance presets, albeit ones that essentially required the whole of the M1’s resources to play. 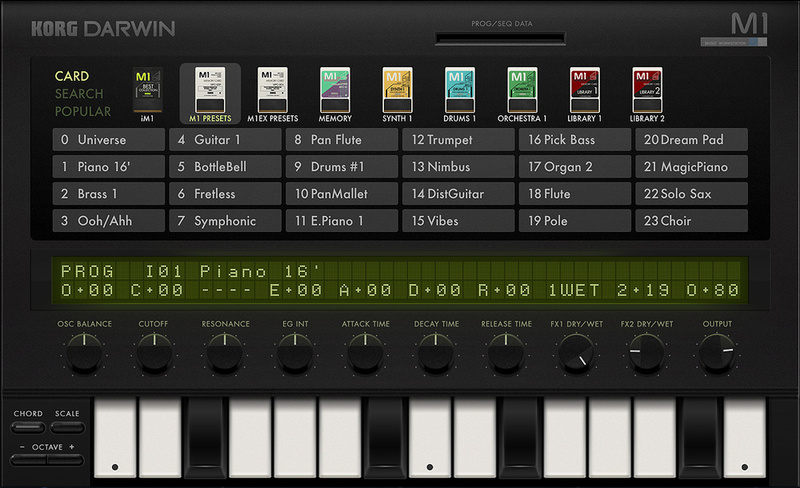 After releasing a plug-in version of the M1 as part of the Korg Legacy Collection (KLC) back in 2007, and even a version for the Nintendo 3DS in 2013, Korg have now brought the M1 to the iPad in the form of the new iM1 app. The user interface is essentially a cleaner-looking take on the KLC version, which is no bad thing as the page-based layout is pretty intuitive. And it’s likely the underlying code is based on this version, too, as both reincarnations implement resonance on the filters (a feature the original M1 lacked) and can share the same preset files. One of the nice things about the KLC plug-in was that it included all the M1 expansion cards as well as the T1 sound disks. (The T1 was an upgraded M1 with an onboard disk drive.) However, when you download the iM1 app you’ll only have access to around 1000 programs and combis, which include a ‘best of’ bank chosen especially for the iM1, along with the original M1 and M1EX (an expanded M1) presets and four ‘cards’. 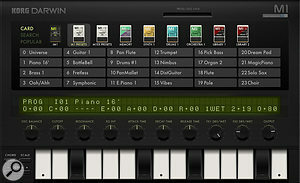 Additional sounds are available via two in-app purchases: one for the remaining 16 M1 expansion cards (one of which comprises the presets from the KLC plug-in), and the other for the T1 presets along with 10 additional sound disks. Altogether there are a total of 3300 factory sounds available for the iM1, and a number of blank ‘cards’ are provided for storing your own programs and combis. Darwin is available to Gadget users who also have the iM1 installed, and amusingly provides an M1-inspired LCD display not included in the iM1 app itself!Much like Roland’s Sound Canvas for iOS, the best thing about iM1 is also the worst thing about iM1, in that it sounds exactly like the real thing did 27 years ago. That’s great, because the M1 was a brilliant instrument in its day, and it really is pleasurable to hear and screw around with it again. As you go through the presets, you keep getting that reaction of ‘yep, I remember that sound!’ The downside is that there’s no denying the vintage of the majority of sounds, and if you’re not familiar with the M1, don’t download this expecting a Kronos. One of the features that made the M1 popular was its built-in sequencer, and despite cheekily including the same ‘8 TRACK SEQUENCER’ wording under the M1 logo as per the original, the iM1 app does not in fact include an eight-track sequencer. This isn’t perhaps a big deal, given that there are plenty of other sequencing apps available for iOS, and iM1 includes full support for Core MIDI, Bluetooth MIDI, Inter-App Audio (as both an instrument and a generator), and Audio Bus 2. 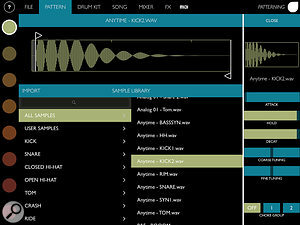 Korg also offer their own sequencing app called Gadget (reviewed in the March 2014 issue), which, if you haven’t tried it, is really, really good. And although Gadget can’t trigger external instrument apps like iM1 directly, it will detect if you have iM1 installed on the same iPad and give you access to over 1800 of the programs via a new gadget called Darwin. However, because Darwin is a single-channel instrument, you don’t get access to the combis (although you can of course use multiple Darwin instances). To compensate for the fact that iM1 doesn’t have a sequencer mode like the original M1, in addition to the program and combi modes mentioned earlier, and like the KLC plug-in, it also includes a multi mode. This turns the app into an eight-part sound module and is the mode you should use most of the time when working in conjunction with a sequencer. The original M1 had a polyphony of just 16 voices, but for iM1 Korg have increased this to 64 voices, although you’ll need the latest iPad Air 2 to achieve that performance. For older models Korg say that the iPad Air, iPad Mini 3, and iPad Mini 2 should manage 60 voices, while the fourth-generation iPad can muster 48 voices; and even the third-generation iPad, the iPad Mini, and iPad 2 can play a still-respectable 32 voices.